Now in its second edition, Construction Law is the standard work of reference for busy construction law practitioners, and it will support lawyers in their contentious and non-contentious practices worldwide. Published in three volumes, it is the most comprehensive text on this subject, and provides a unique and invaluable comparative, multi-jurisdictional approach. 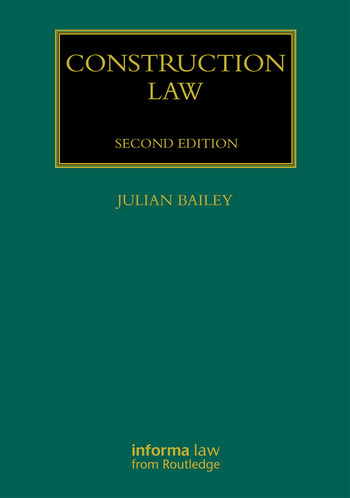 This book has been described by Lord Justice Jackson as a "tour de force", and by His Honour Humphrey LLoyd QC as "seminal" and "definitive". This new edition builds on that strong foundation and has been fully updated to include extensive references to very latest case law, as well as changes to statutes and regulations. The laws of Hong Kong and Singapore are also now covered in detail, in addition to those of England and Australia. Practitioners, as well as interested academics and post-graduate students, will all find this book to be an invaluable guide to the many facets of construction law. Julian Bailey is a partner at White & Case LLP, where he practises in the International Arbitration and Construction and Engineering Groups. He is Chairman of the Society of Construction Law (UK), and has won that society’s Hudson Prize on two occasions. "There is no other tome which touches this contribution to construction law. It provides an encyclopaedic knowledge of the subject." "The second edition of Construction Law stands upon the shoulders of the giant achievement that was the first, and encourages us to look forward to many further editions which will continue to illuminate our fascinating yet complex area of law. The international construction law community is once more in Julian Bailey’s debt." "Bailey has once again created a practical epic, establishing himself as a virtuoso of construction law on an international scale. The second edition, like the first, is a friend to construction law, written as a guide to the field’s ins-and-outs and a tool to navigate its halls. I have full confidence in recommending this text to any practitioner or student in need of a comprehensive and authoritative collection of all things construction related." "The writing is efficient and pellucid…every section covers its scope with the right amount of detail, neither leaving the reader hungry for more, nor sedated by incursions into unnecessary detail. "…outstanding…Wherever one looks, the completeness of coverage and case citation stands out as does the clarity of the exposition. Practitioners need this…this is a true practitioner’s work in an area where much law is made and practised here and overseas." "Now in its second edition - eagerly anticipated by the legal profession internationally- Construction Law is firmly established as a classic. Indeed, it is one of the finest works in any branch of English or Australian commercial law published in the past half century. Construction Law is a magisterial work. It is impossible to praise it too highly. The author has distilled principles from an enormous body of case law...and covered the breadth of construction law with great skill and clarity. One can only marvel at the author's extraordinary achievement."